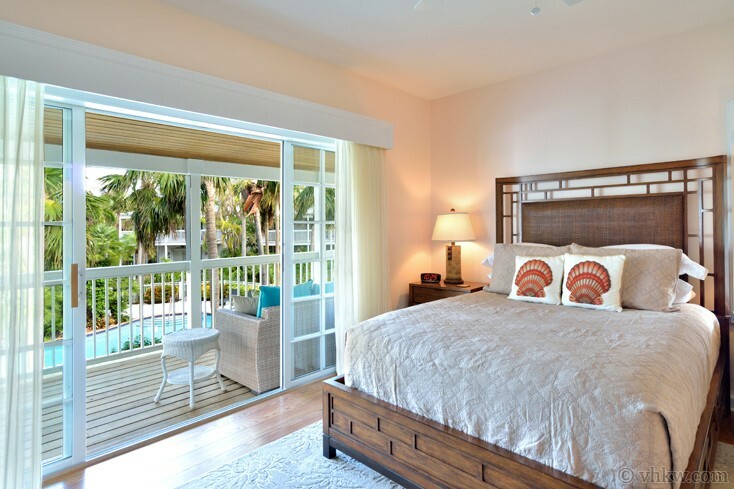 No other private Caribbean island resort presents its exclusive homes with such enchanting elegance, as Sunset Key. 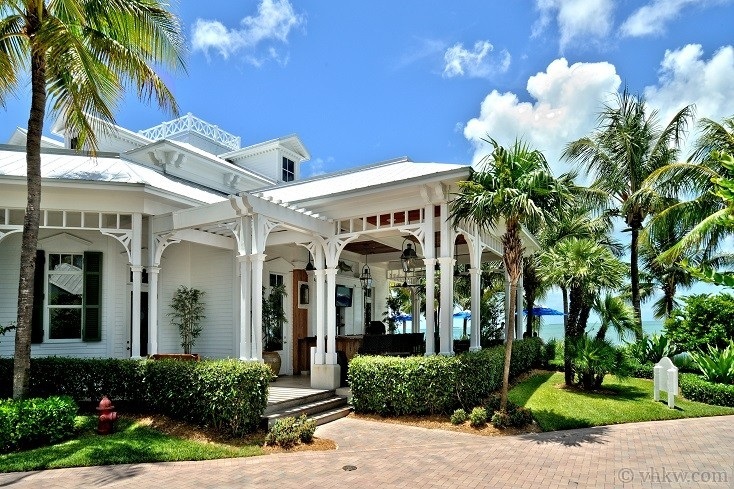 When I took the 15-minute ferry ride from the Key West Margaritaville dock to preview this luxury villa, I was so inspired that I wrote a poem about it. 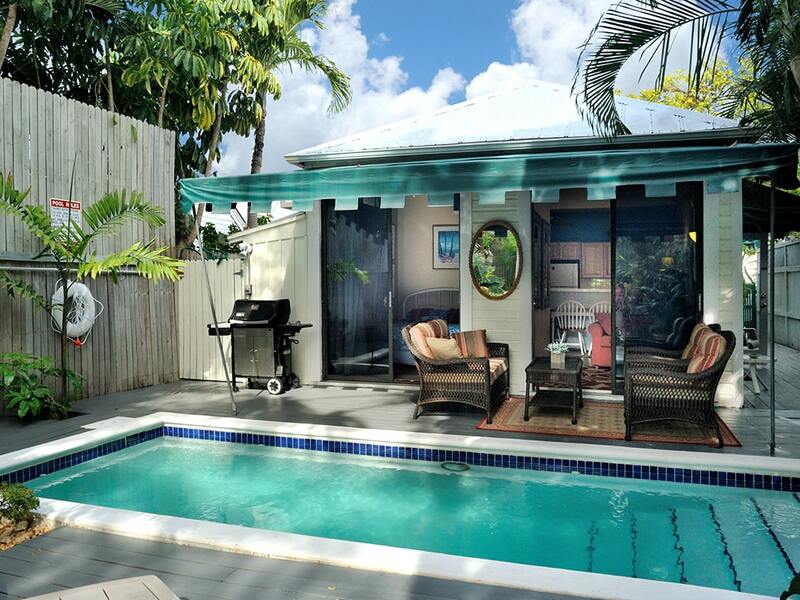 Now, I know this is an unorthodox way to introduce a Key West vacation rental. But at VHKW, we strive to offer you something unique, a little bit ahead of the trend, and in this case a playful sonnet - a 14-line poem, each line with 10 syllables. 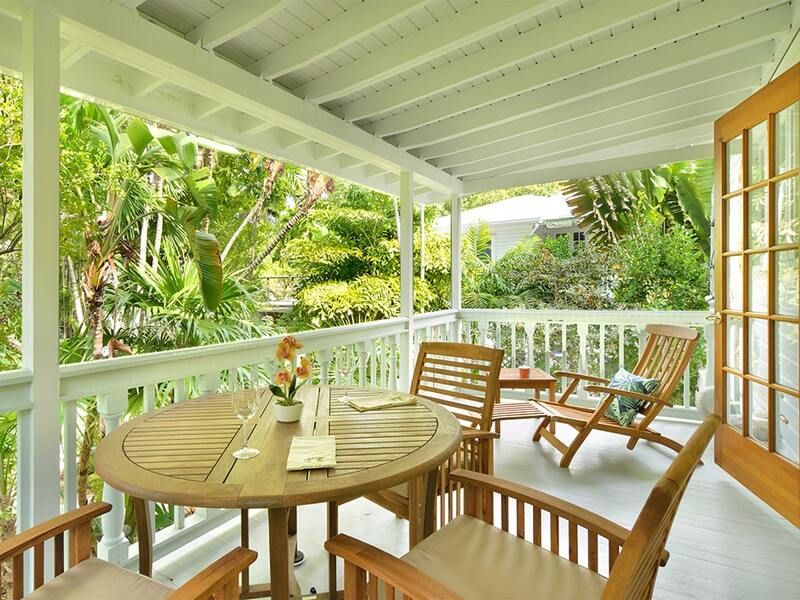 But in case you’re are not charmed by island poetry, we use our usual format after the poem, to describe the property layout in detail - the grounds, and the special amenities it offers. Even if you are only half as captivated as we are, you’ll most likely want to rent this deluxe home, we call Sunset Sonnet Luxury Villa. A crescent beach with powdery white sand. Towering palms, and ospreys flying by..
Near the action yet without the worry. The best of both worlds for your family. With this home you've found a dream-worthy jewel. It's island time here, with pure luxury. 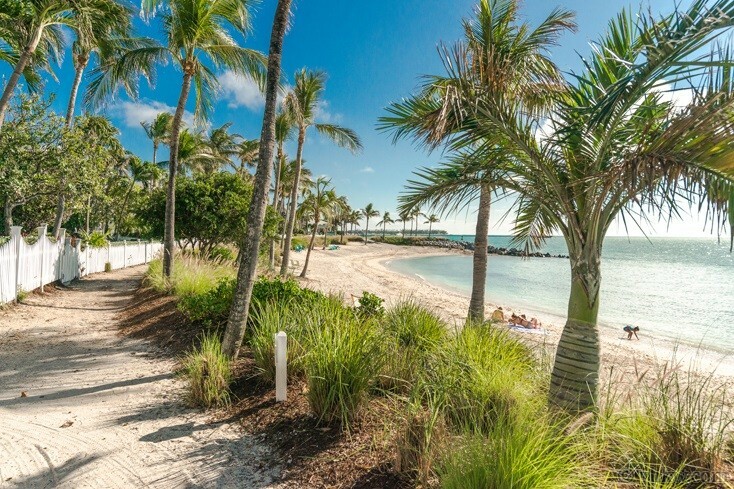 Getting There: Only 500 yards and a 5 minute ferry boat ride away from the Key West Margaritaville dock, when you arrive you’ll feel like you’ve been transported to an exotic island estate somewhere in the Bahamas. Exclusive for guests only the ferry operates 24 hours a day, so when you get carried away into the charms of Old Town Key West, it’s there to carry you back home. 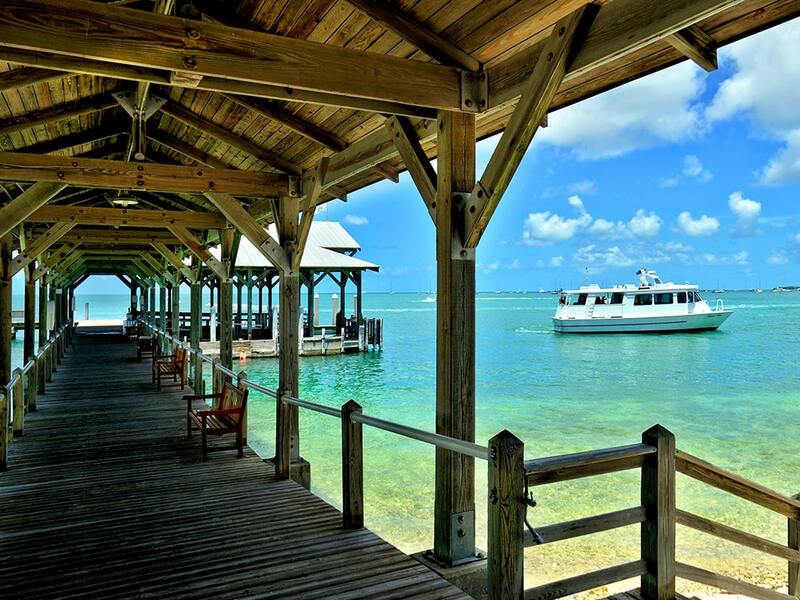 We begin our tour as the ferry pulls up to the iconic Sunset Key boat-house dock, which serves as the main entrance to the island. With views of the white sandy beach and coconut palms on either side, the scene is exotic and luxurious at once. 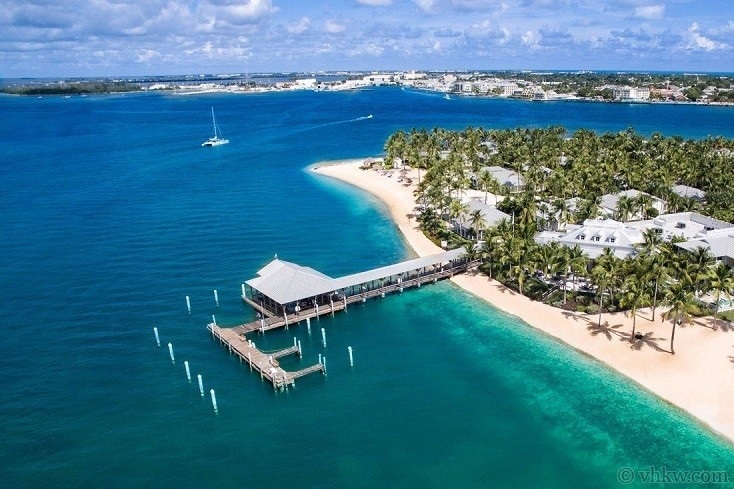 As you approach the preeminent manor house on your right, you’ll recognize that it’s actually the headquarters for the resort amenities you’ll have access to, including the 5 Star Latitudes Restaurant and the bar staged perfectly as a gazing point out to sea. I savored the short walk to the Sunset Sonnet Villa, through the perfectly manicured tropical grounds of this exclusive neighborhood. Brilliant red and orange bougainvillea, exotic flower vines, white picket fences and garden trellises, freshly cut hedges, and towering palm trees along the pathways. You’re sure to appreciate the unique opportunity to walk around an island absent from noise and pollution of cars, exhilarating in and of itself. With beautiful grounds all around, you can choose how you want to enter the house. The most direct approach is along a garden path, through an arbor and directly to the front porch. Another vantage point is from the oasis style swimming pool garden, where the house stands stately along the perimeter. From either approach, you’ll notice how wide and expansive the covered porches are as they wrap around three sides of the plank walled building, both on the 1st and 2nd floors. 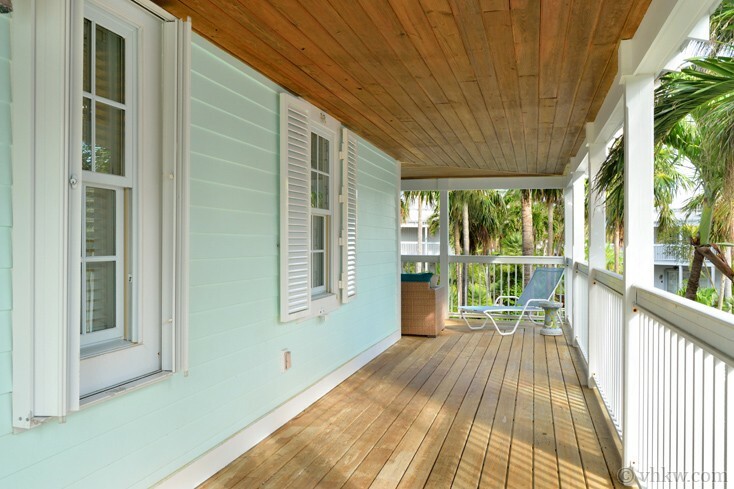 Both floors of porches have multiple French doors to maximize the opportunity for indoor-outdoor living. 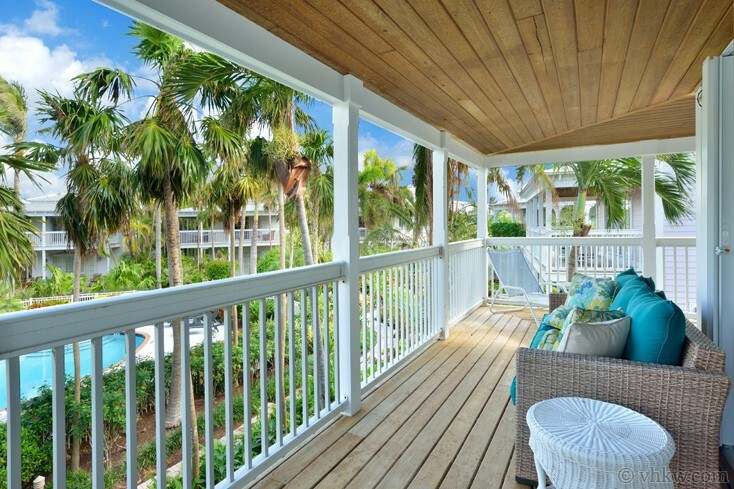 Outdoor porch furnishings assure the pleasure of a prominent view of the gardens and the swimming pool in comfort. After all, this is what the Caribbean island lifestyle is all about. 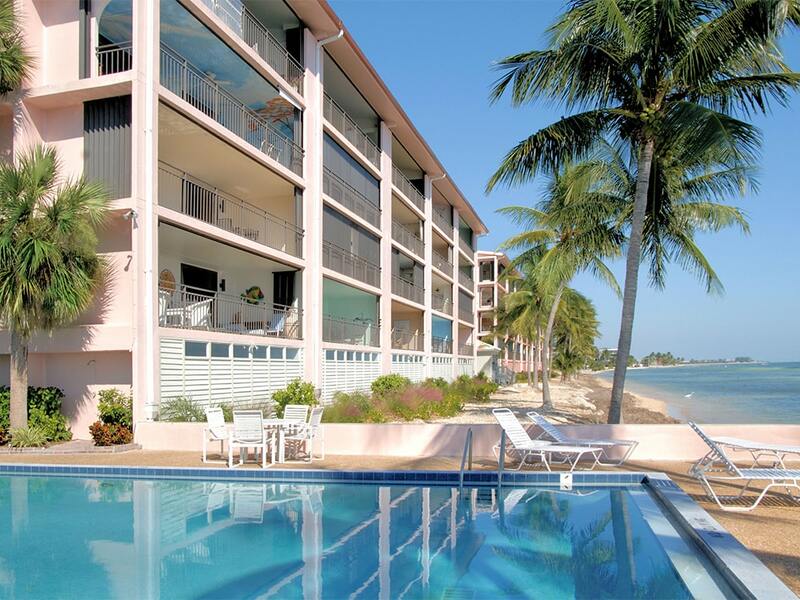 But it gets even better – a walk-up 3rd level leads to the covered roof top tower, specifically designed for an extraordinary view of famous Key West sunrises and sunsets. 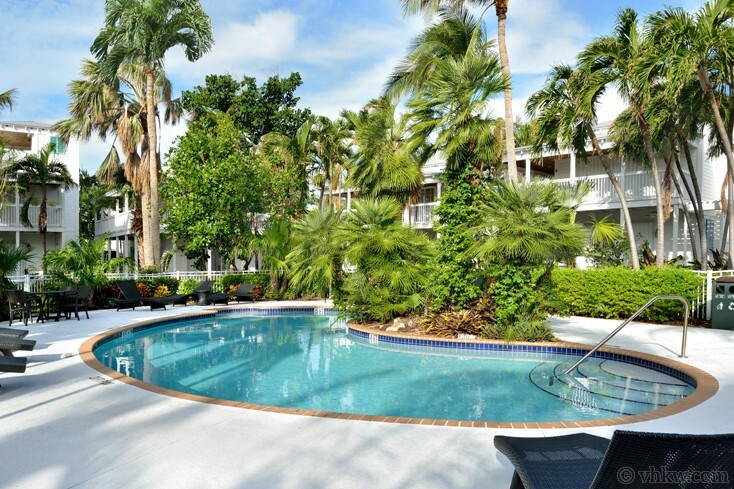 The neighboring homes of Sunset Sonnet Villa vacation rental, are situated in manicured tropical gardens surrounding the oasis style swimming pool. 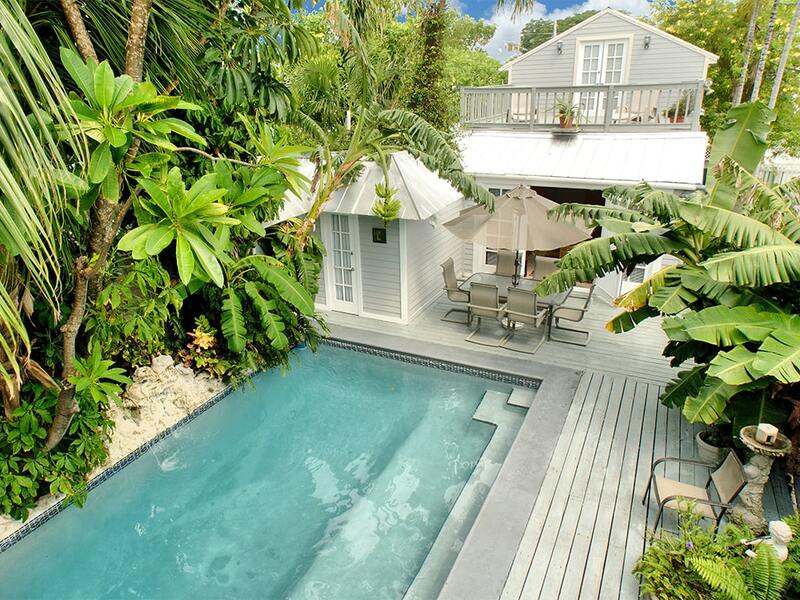 With only ten other private luxury homes sharing the pool and gardens, exclusivity is assured. 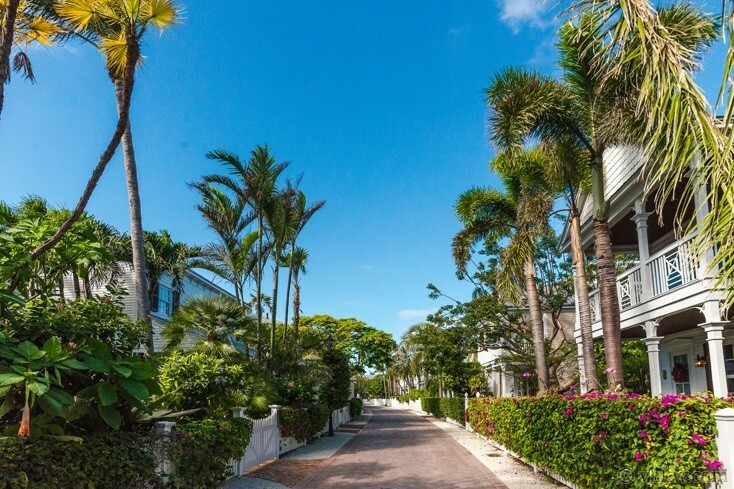 Another premier feature of this neighborhood, is access to the 5-star hotel amenities of Sunset Key, including order-in dining service. Though you are in a pivate home, at your service is a central concierge and security program on a private 27 acre tropical resort island, which includes an ocean-side and the award winning restaurant and full bar, Latitudes. 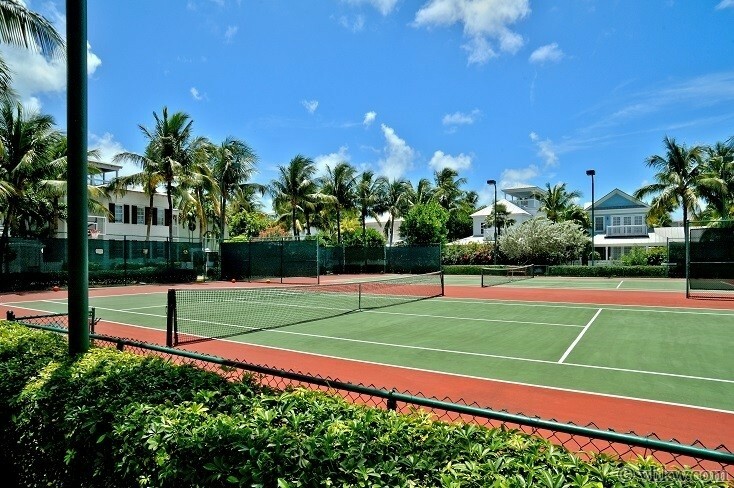 You’ll also enjoy access to the full service luxury spa and gym, and use of the tennis courts. Our tour begins at the front entrance which steps though a double set of French doors. Directly to your right is the spacious great room, where travertine floor tiles, white ceilings, and sunshine yellow walls bounce light all around. The interior designer created an upscale resort island ambience by using a combination of light wood, wicker, bent bamboo furnishings, throughout the home. 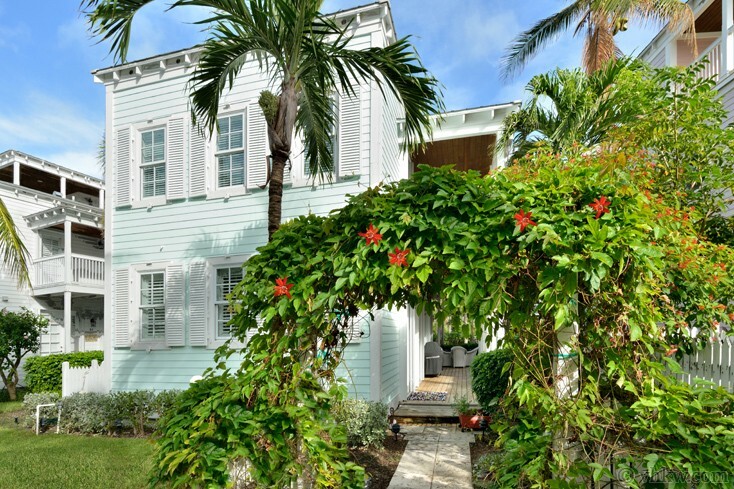 Custom plantation shutters on the windows and doors throughout add an opulent colonial touch. Downstairs: The open-concept great-room assures plenty of space for your family to spread out to relax, entertain and be entertained. Set to create a living room grouping on one side, with dining area and kitchen on the other, a focal point is the large earth-tone L-shaped sofa, easy-chair, and the entertainment center. 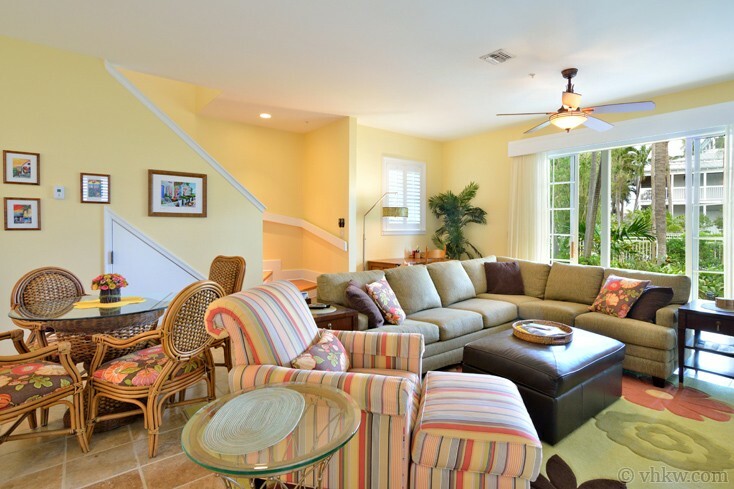 This traditional layout offers plenty of room to snuggle in and watch the large flat screen TV or play video games. A round glass dining table and bamboo with wicker dining chairs is placed for easy access to the kitchen on the other side of the room. 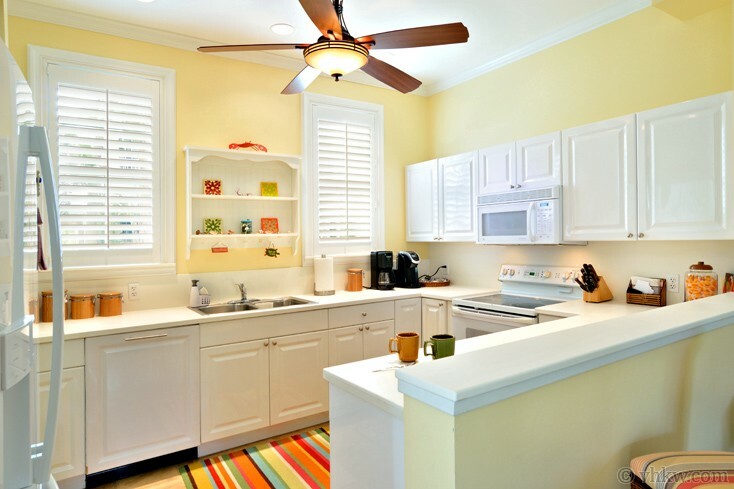 The spacious L-shaped kitchen is stylishly done-up, all in white, a natural compliment to the yellow walls. Custom cabinets with Corian countertops, glass top electric range, space-saver microwave, a double stainless steel sink, double French door fridge with bottom drawer freezer - all the accessories you need to cook up a feast. Another fabulous feature, is the full-size laundry room, tucked just past the refrigerator, complete with stackable washer/dryer and laundry sink. 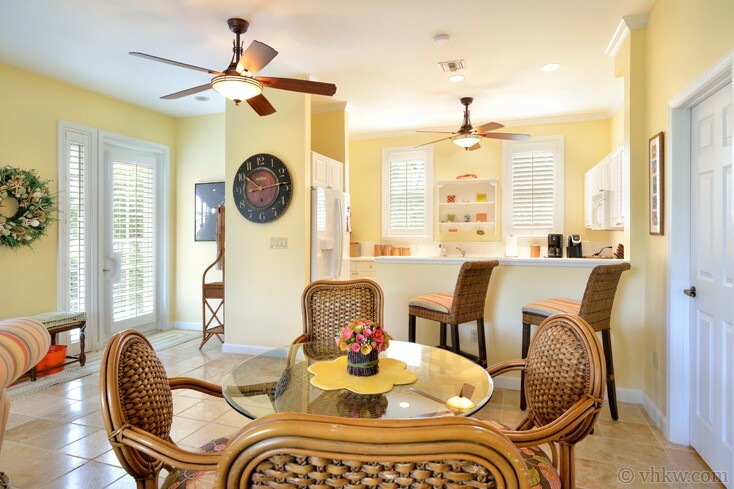 When it’s time to casually nibble and imbibe, enjoy sitting at the open-shelf breakfast bar/ cocktail counter with wood and wicker counter chairs. When you want to sit down to relax and dine, your choice is the round glass dining table. That is unless you decide have a feast on the covered porch outside. Our next stop is the 2nd floor, but first, please take note of two more features, a half-bath (sink and commode), and a writers desk. 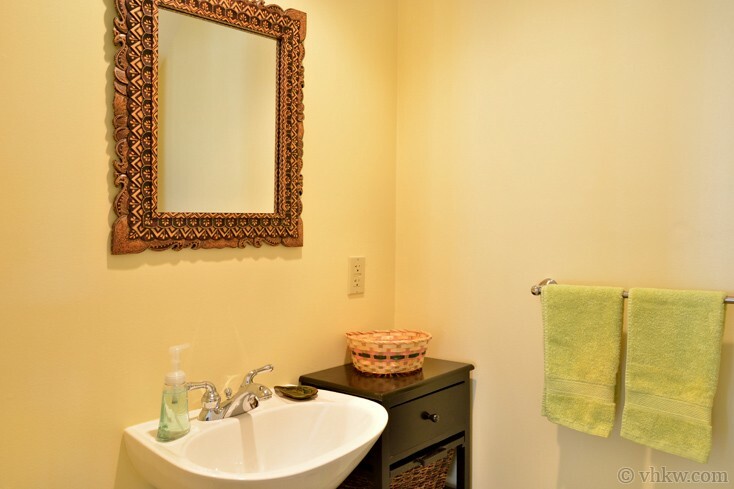 The bathroom is located just to the left of the front entrance, easily accessed when coming in from the swimming pool. The desk, staged near the base of the stairs, is set back from the living room grouping. This is a welcome amenity for anyone who needs a dedicated place to set up a a lap top and work remotely. Upstairs: Ascend upstairs via the wooden stairway, that gracefully winds to a spacious landing. 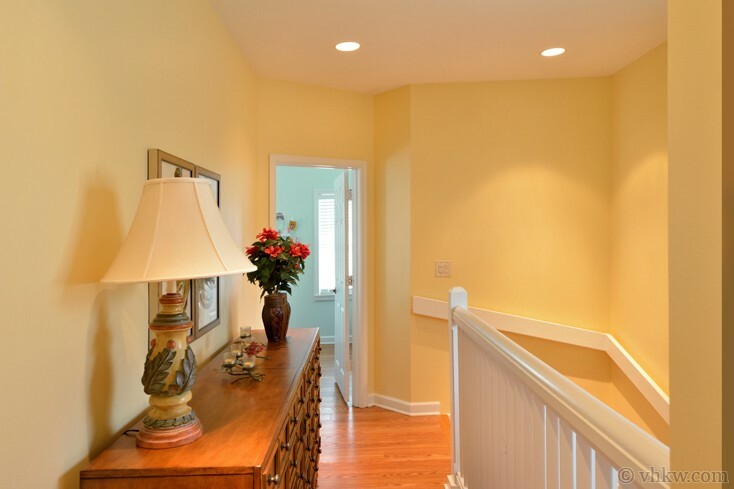 The yellow and white theme is continued up the stairway; flat wide hand railings and trim boards accentuate the graceful lines. The 2nd floor landing becomes a hallway, leading to the master and the guest bedroom, each with en-suite bathrooms. Both bedrooms have hard wood floors and provide multiple windows for viewing the garden and pool scene below. Yet each is unique, offering a custom décor providing a heart-felt ambience. Let’s start in the guest bedroom, located immediately to the top of the stair landing. 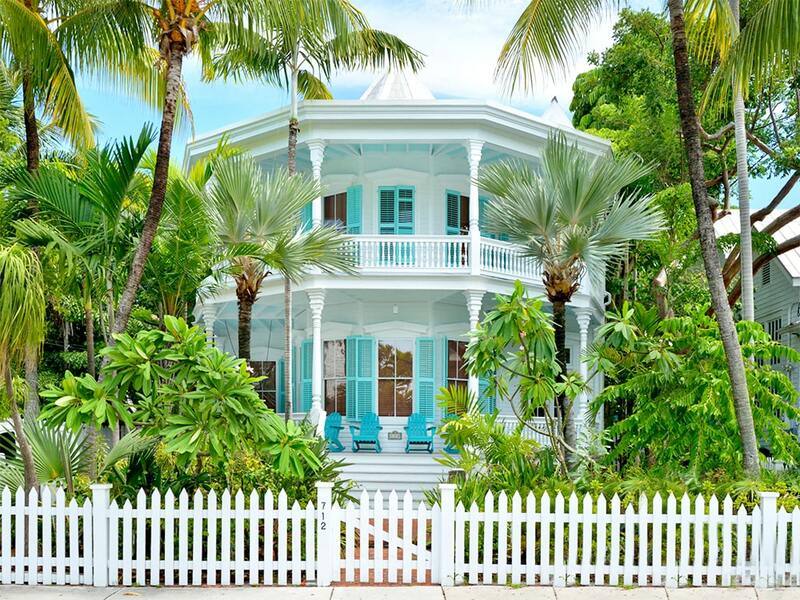 Walls are painted a quiet sea-foam green, and playful tropical themed artwork that captures a delightful Key West style. 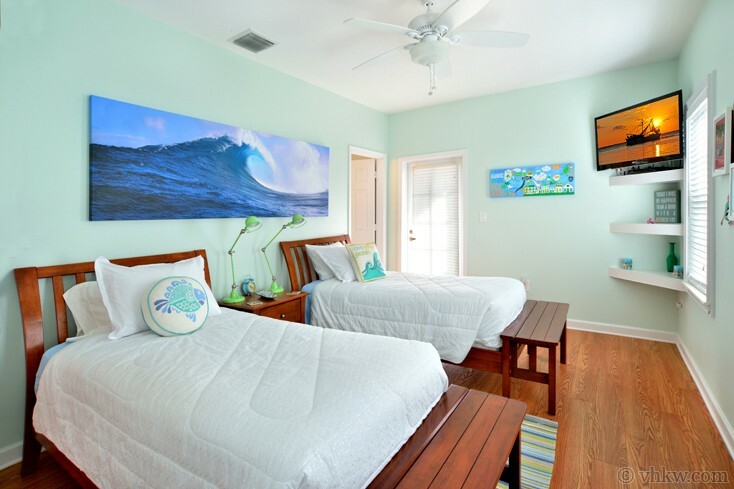 My favorite is the painting title, ‘Guide (that helps you avoid all the cheesy touristy crap) in Key West.’ This room is furnished with two twin size beds, (that can be pushed together and made into a king), and a flat-screen TV is mounted on the corner for easy viewing from bed. A single French door, next to the bathroom, leads to the 2nd floor wrap around porch, providing private outside access, for a spectacular view of the gardens and the pool. 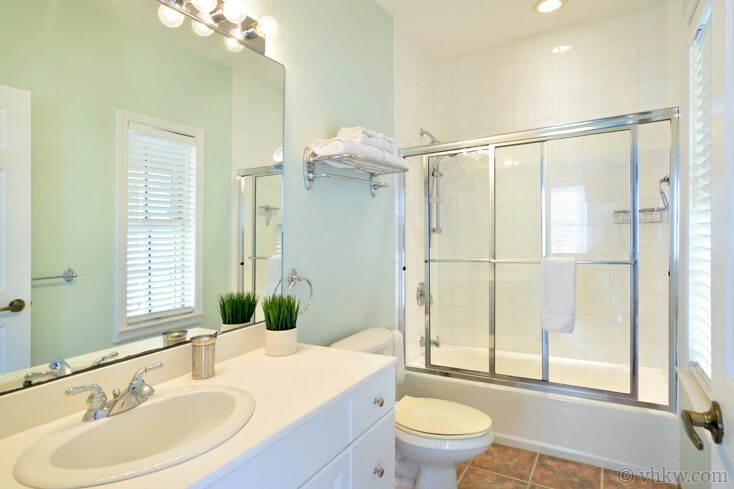 The en-suite bathroom, done in bright white cabinets with contrasting dark tile floors, provides a large vanity with single sink, long bathtub with in-tub shower, with clear glass doors. 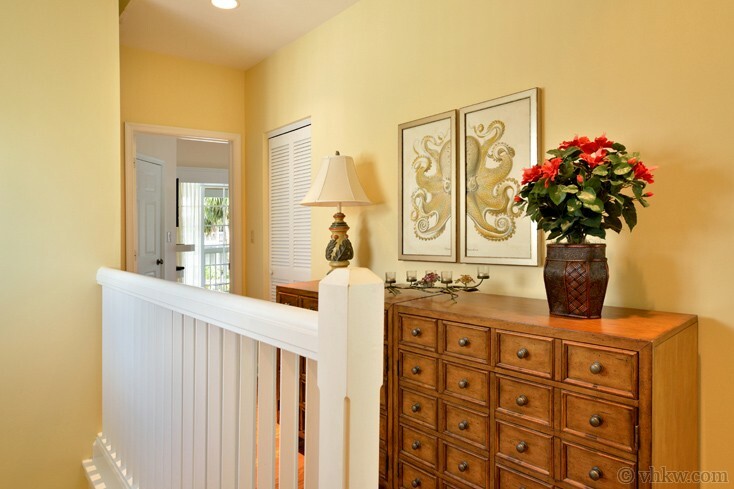 Returning to the hallway, we walk to the opposite end of the house, to the master bedroom. Tastefully furnished with a wood and wicker queen size platform bed and comfortable easy chair, walls are painted pastel coral with white trim. A large flat-screen TV is mounted on the wall opposite the bed. Indoors flows naturally to the outside, through double sets of French doors leading to the 2nd floor covered porch. A panoramic view of the swimming pool and gardens below is made even easier to enjoy with a comfortable sofa. 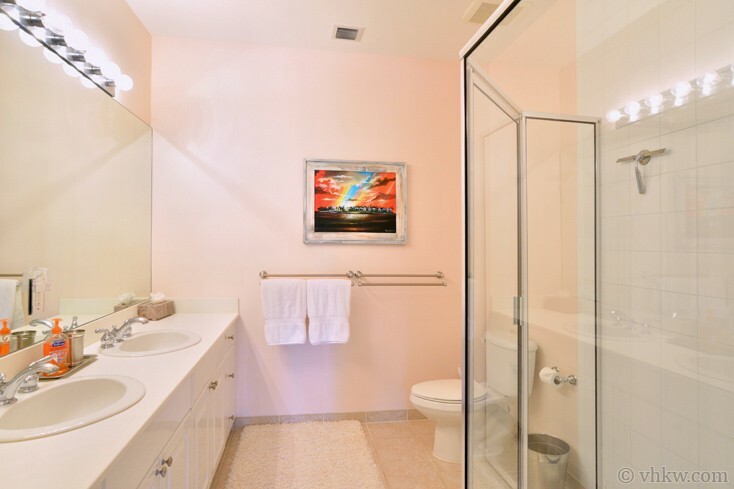 The en-suite master bathroom provides double sinks set on bright white cabinets, an oversized shower with frameless glass doors, and upscale fixtures and accessories. Rooftop Deck: Just outside the master bedroom, a custom spiral staircase takes you even higher to the intimate outdoor rooftop room. 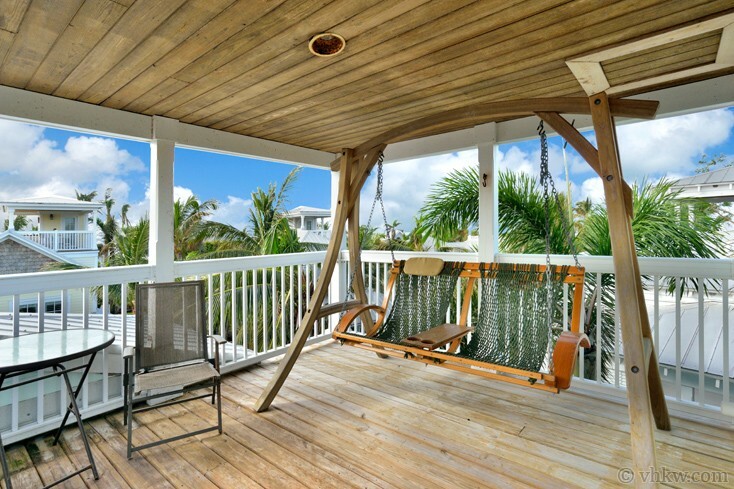 Furnished with an artful porch swing plus a cocktail table, this is the place-to-be for sunset, star gazing, and attitude adjusting. 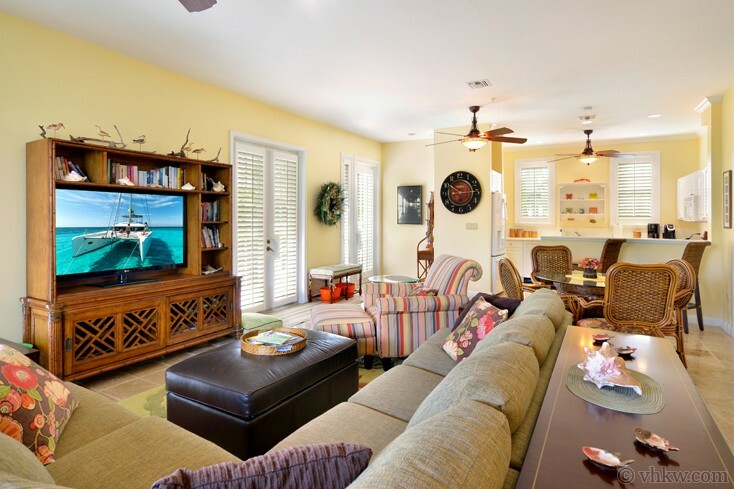 Arguably, the premier spot in the house, it offers fresh tropical breezes, and a view of mother ocean … all you need to bring is a margarita, a cold beer, glass of wine, or a cup of Cuban coffee. Plan to make memories that last a lifetime. Parking and Transportation: If you are driving to Key West, parking passes are available to park a car at the covered hotel parking garage on Front Street. 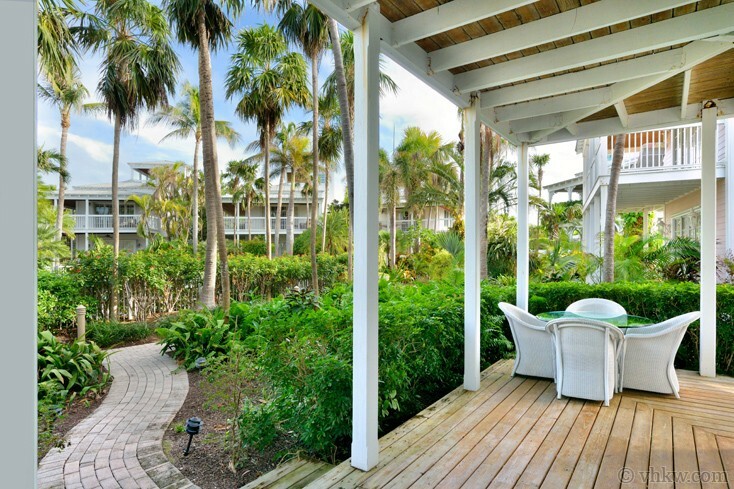 Steps from the garage you’ll find the private dock where you catch the - 24 hour a day ferry that runs to Sunset Key. 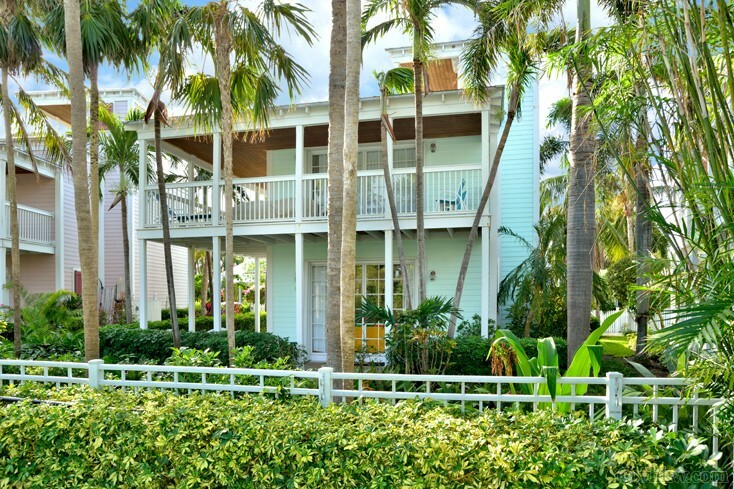 The five minute, 500 yard boat ride gives the feeling of being transported to a glamorous destination and once on the Sunset Key dock, the home is a short walk away. House Amenities: Covered roof-top deck viewing tower with private sunset view, covered wrap around verandah porches on the 1st and 2nd levels with pool garden views, mature tropical landscaping, shared oasis style swimming. 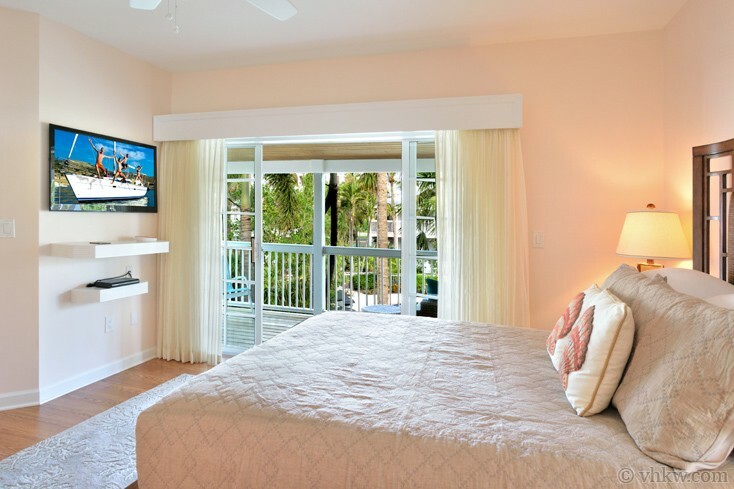 Interior amenities include fully equipped kitchen, full laundry room, central air conditioning, office desk, WiFi, large flat screen TV’s in the great-room and each bedroom. 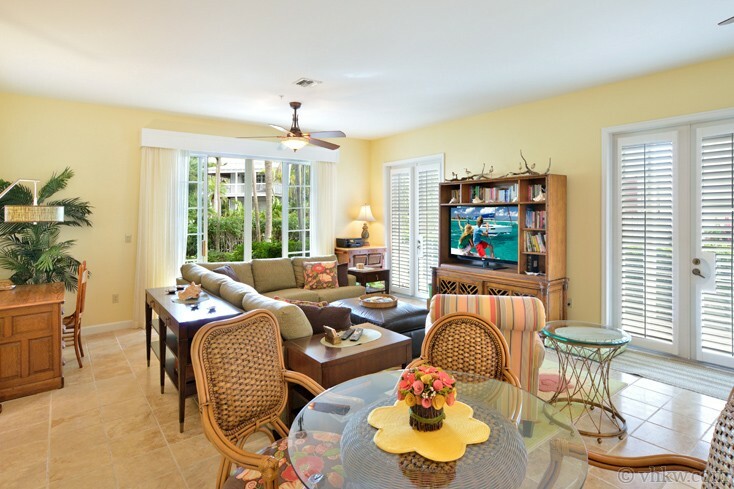 Resident guests at Sunset Key have access to a nice array of resort amenities. Here the lifestyle is designed to provide ‘world-class luxuries’ that are usually only available at much larger luxury resorts including: an award winning beachfront restaurant offering Continental and Island Cuisine; full bar; order-in dining service, full service Spa, white sand beaches, tennis courts, grocery deliver, 24 hour regularly scheduled ferry service (water taxi), and more. 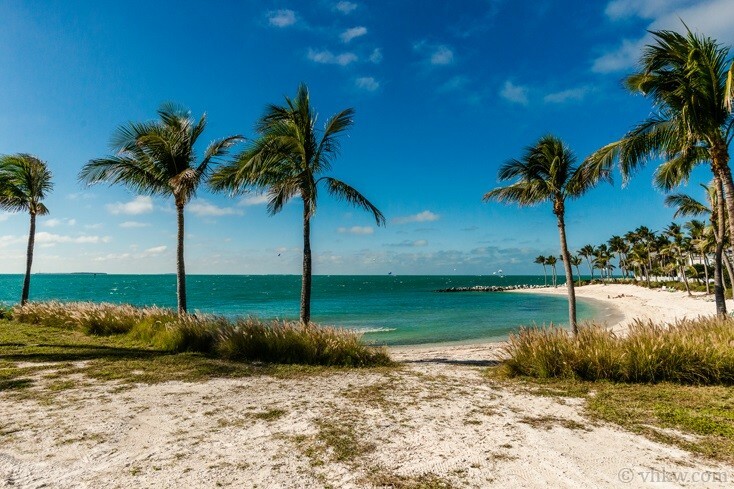 Sunset Key is a gorgeous 27 acre private tropical island located approximately 500 yards off-shore from Key West, where the Atlantic Ocean and Gulf of Mexico meet. 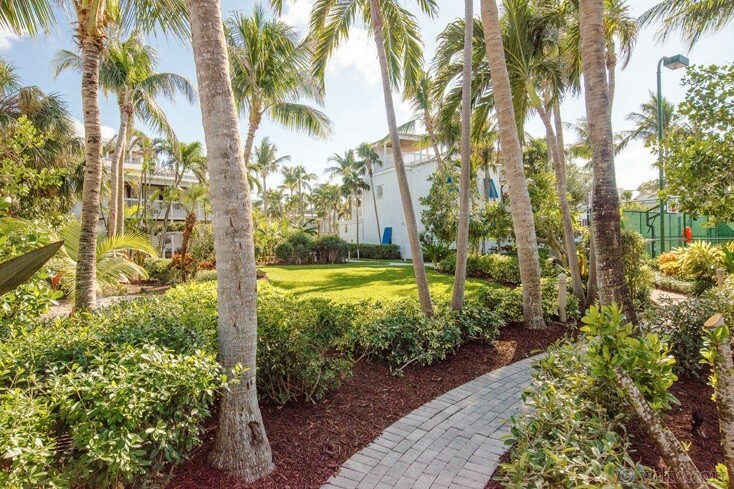 Paradise grounds are perfectly manicured and lushly landscaped with palm trees, tropical flower gardens, white picket fences, winding walking paths, and narrow brick roads. From here you’ll experience some of the most stunning sunsets you’ll see anywhere in the world. 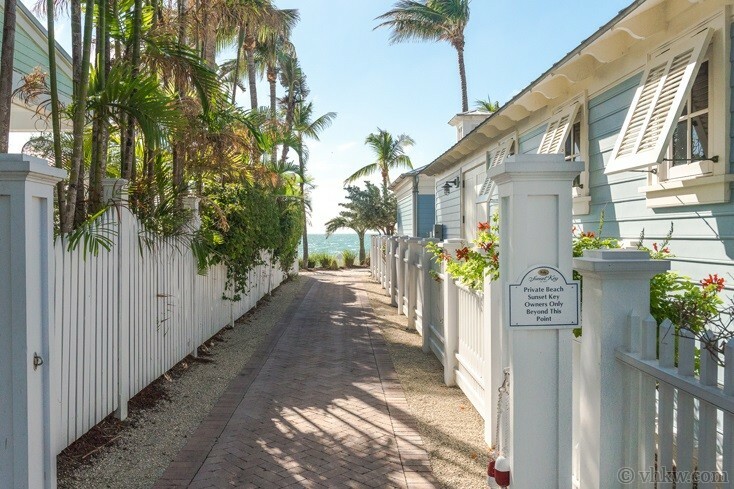 The Sunset Key neighborhood has a premier collection of luxury island villas and cottages built in classic Key West architectural style with wide sitting porches, tin roofs, wrap verandas, and white picket fences. 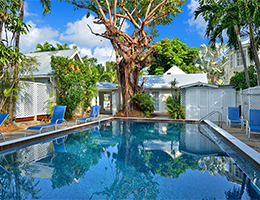 Designed for the discerning traveler, Sunset Key is a relaxing and quiet resort island, offering 5 –hotel resort amenities. 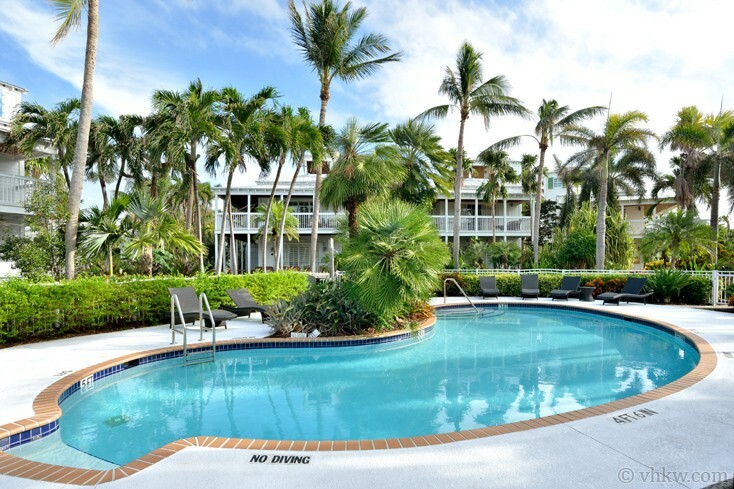 Staff are committed to preserving our fragile ecological environment and the property is a certified Green Lodging facility by the Florida Department of Environmental Protection. They are committed to making efforts to reduce water and energy consumption and solid waste. 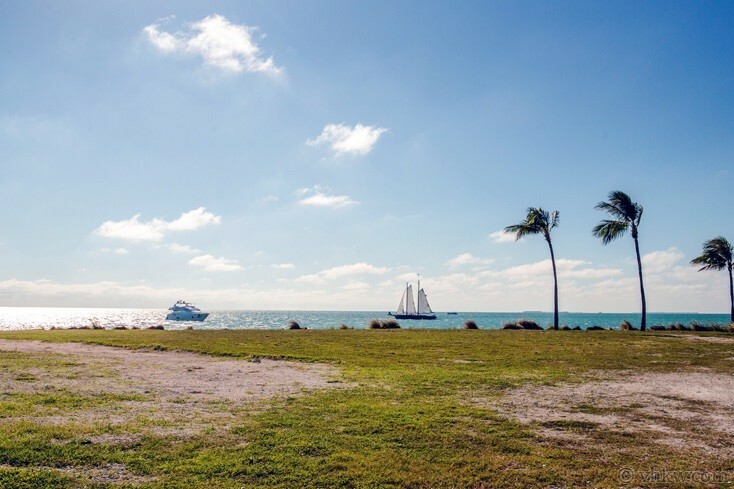 The ferry from Sunset Key takes you to the 'main island' of Key West, where you’re steps from Front Street, Mallory Square, and Duval Street. Plan to walk around and discover what you love most about Old Town within a few blocks walk. Choose from local and national and international cuisine, famous nightlife, craft breweries, wine tasting, homemade ice cream, boutique and souvenir shopping, art galleries, the Historic Seaport Harbor Walk, Custom House Museum, Lighthouse Museum, the Shipwreck Museum sunset sailing, reef snorkel and dive trips, Fort Zachary State Park Beach, and more. We also recommend that you take the time to explore beyond the blocks immediately around the Margaritaville dock. Downtown Old Town Key West and the surrounding waterfront area, is where the settlers of late 1800's built the first shipping docks, warehouses, grand wooden homes and shot gun cottages that stand side-by-side as one of the largest and most impressive collection of turn-of-the-century Victorian gingerbread architecture in the United States. Today, most of these alluring structures have been restored and renovated to stand in their gleaming glory. Restrictions: This is a SMOKE FREE house. Absolutely no pets please! We do not accept guests less than 25 years of age unless accompanied by a family group or guardian. Notes: If you are planning a festive event, such as a wedding or reunion, please contact our staff for further information on how Sunset Key can provide you with fact sheets on available gathering and meeting facilities. 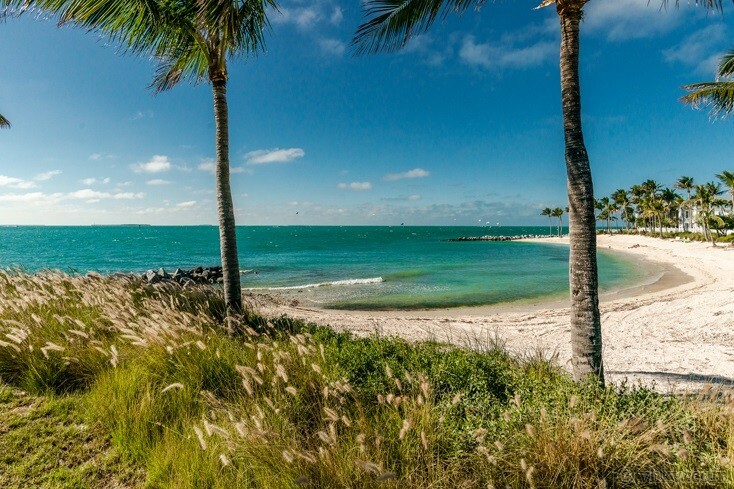 It is not possible to stage an event in the home, but we can assist you with the perfect setting on Sunset Key, closeby. This home is intended for a family, professionals and executives who are looking for a private estate home with upscale Quality Amenities. Holiday, Festival, and Event Rates are 20% to 25% higher. 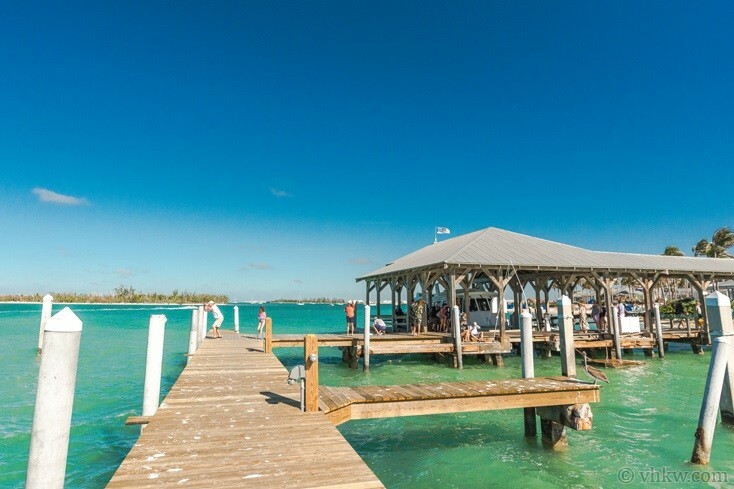 These include, but are not limited to: Fantasy Fest, New Years, Key West Yacht Race Week, Thanksgiving, Power Boat Races, Mini-Lobster Season, Labor Day, Parrot Heads Meeting of the Mind, Biker's Poker Run, 4th of July, Easter. Future Dates not listed, please call 305-294-7358 for pricing. VHKW made it easy every step of the way. 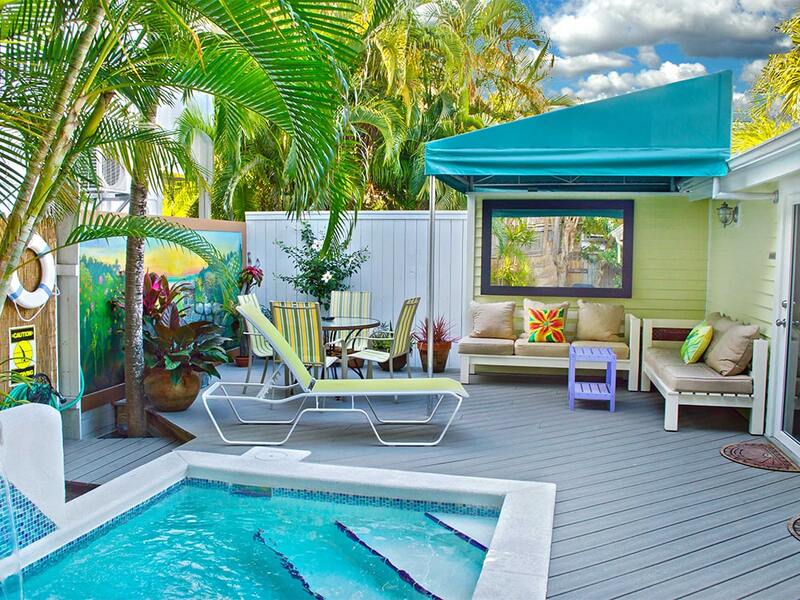 We loved the privacy and the secure feeling of Sunset Key. The house was lovely and beautifully kept--and I was surprised to learn that we got a mid-month cleaning service as part of the package. Page was a delight to work with. We couldn't have had a better experience.